It's really hard to go wrong with baked veggies. There are so many combinations, and they're so easy and delicious. 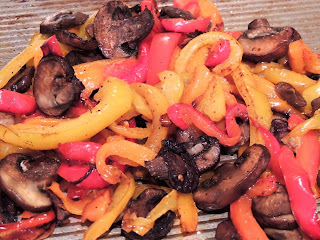 Tonight, we went for a colorful combination of bell peppers - one red, one yellow and one orange plus some crimini mushrooms. Preheat the oven to 400°F. Slice the bell peppers. Put the peppers and mushrooms in a baking pan and drizzle with 1 tbsp of olive oil and TexJoy (to taste). Stir the veggies and drizzle with another tbsp of olive oil and more TexJoy. 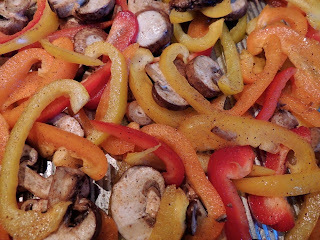 Stir the veggies again and spread out evenly in the baking pan. Bake for about a half-hour or until all the liquid evaporates and the veggies are very tender. Tonight, we paired the veggies with Lobster Ravioli. 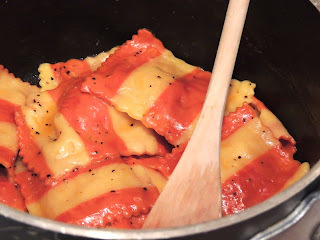 I tried making ravioli from scratch once, and it was a failed experience. 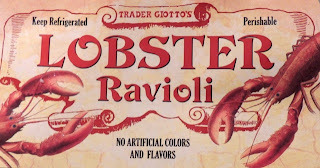 I may try it again sometime, but in the meantime, I've been exploring the pre-made, ready-to-boil ravioli at Trader Joe's. 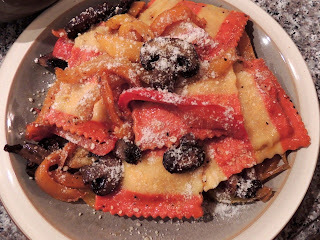 This was my first attempt making the Lobster Ravioli (actually, my husband made it), and we were quite pleased. We just tossed it with a little butter, olive oil and salt and pepper. I was skeptical at first, but there actually is lobster in the lobster ravioli. It's shredded, not chunked, but it's still pretty impressive for grocery store ravioli. I know we'll be buying this again. I definitely recommend checking it out. 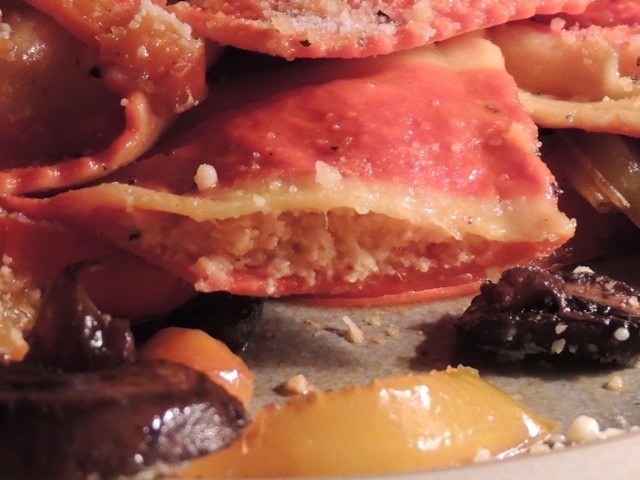 To serve, divide the veggies evenly between 2 plates and sprinkle with Parmesan cheese if desired.